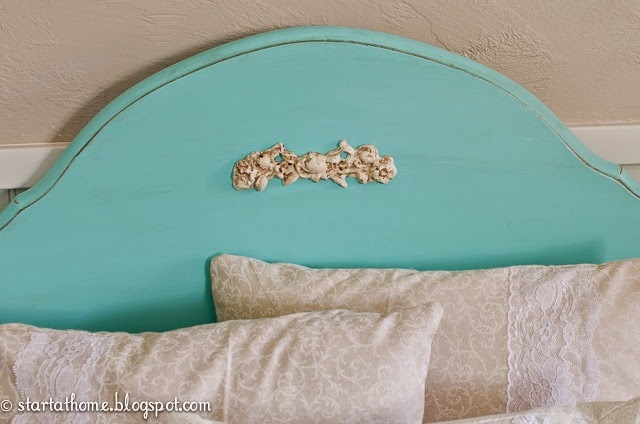 I LOVE brightly colored headboard! They are always so fun to use as a statement piece. I am a little mad I forgot to take a before picture of this beauty. She was quite an eye sore, there was a big faux wood oval in the center with some weird hand painted flowers! You can imagine how happy I was when the oval popped right off! And in its place I added this beautiful appliqué. 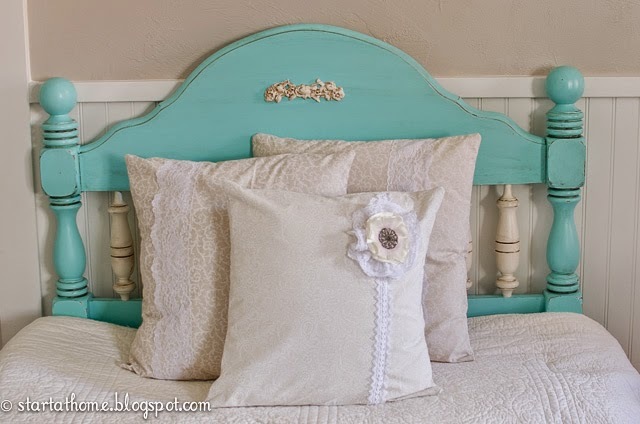 This appliqué made the headboard so much more elegant it had to have lace pillows to go with it! After all doesn't every bed need a few pillows?! 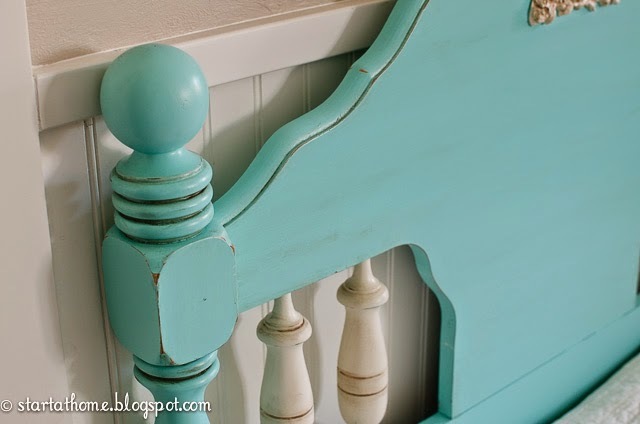 Luck would have it this paint color was in the Mistinted section, I love it when they make mistakes with pretty colors ;) After the bed was all painted up I added the glaze and antiqued it to bring out all the fun details of this bed!! This bed is for sale, if you are interested send me an email or please see the Furniture For Sale Tab at the top of the page!! A Geometrical Coffee Table Anyone?! But the wheels in my head have been turning and itching to create. What is it about a girl and her paint? Man, I sure do miss it all of too often! 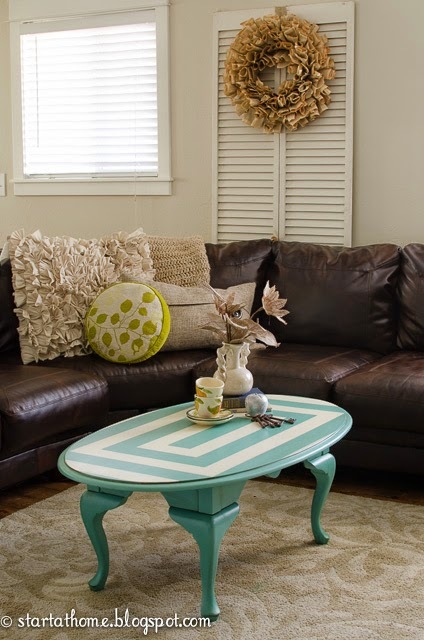 I am so excited to show off this coffee table! 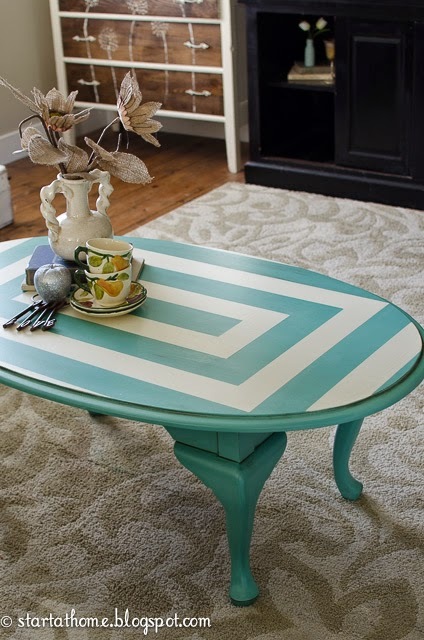 I have always had a thing for coffee tables, as they add a perfect touch of personality to any room. 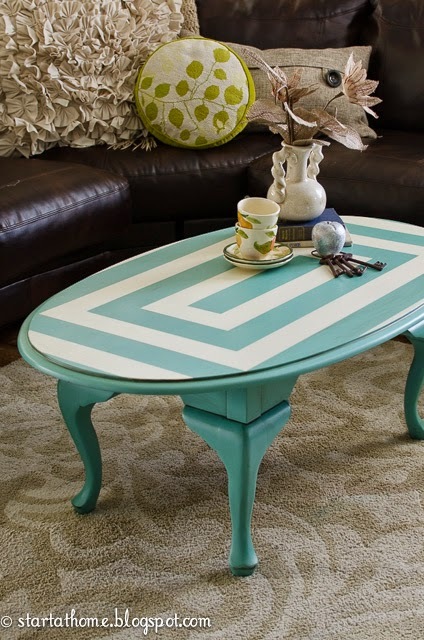 And this coffee table is no exception, I mean look at those legs all french and cute. And the oval top was just calling for a little personality so we took care of that! 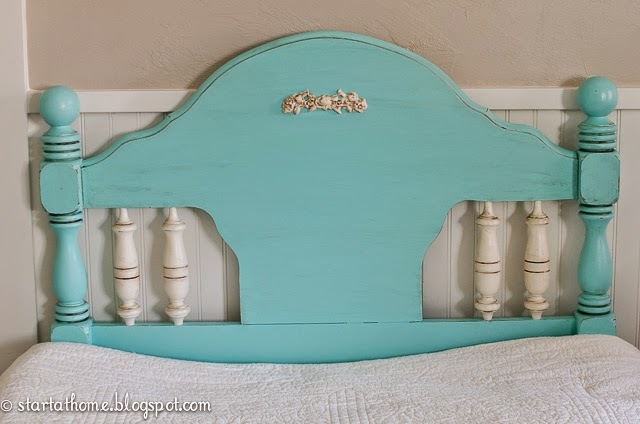 I first painted everything turquoise and once it was dry I measured out how I wanted my design to look. Once I had it sketched out I began to tape everywhere I wanted it to be turquoise. 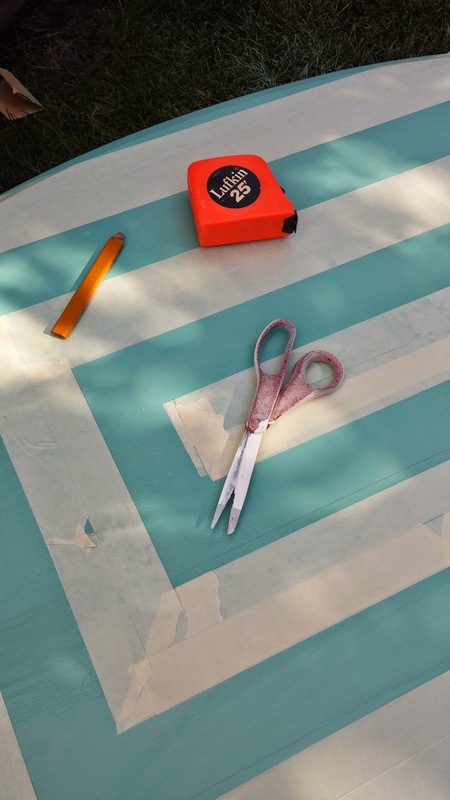 Once it was all taped and measured I seal up my tape (tutorial here) This makes for really nice straight lines! We have ourselves a one of a kind beautiful table, perfect for any room! New Fun Items in the Decor Store!! If you are looking for some new ORIGINAL home decor items you have come to the right place! I have just listed a few new fun items! 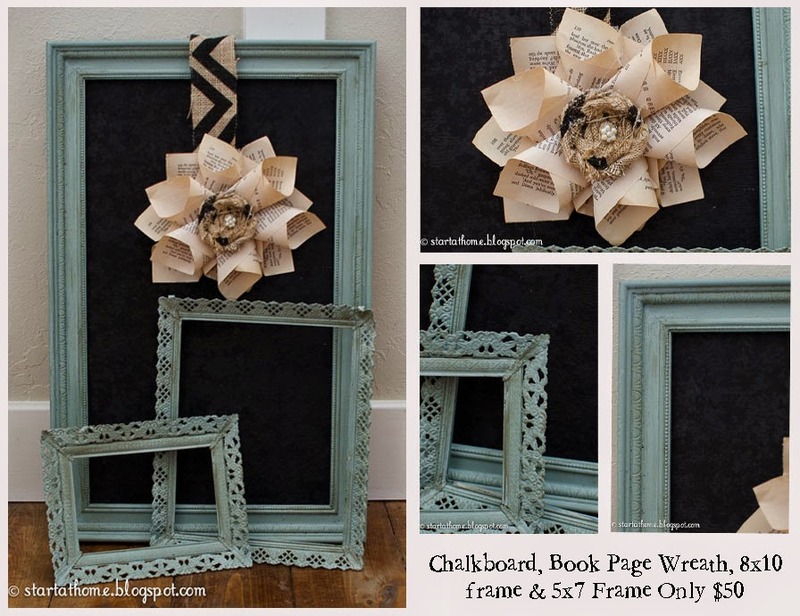 These Beautiful Frames and Chalkboard are painted in a duck egg blue and waxed to accent the details as well as provide protection. 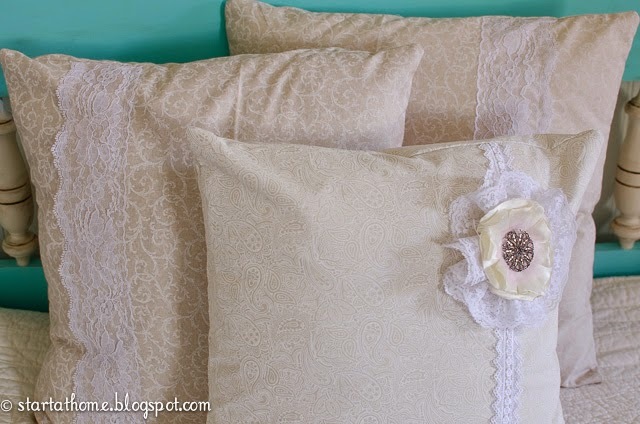 They are the perfect accent pillow for any room and adds a great texture! 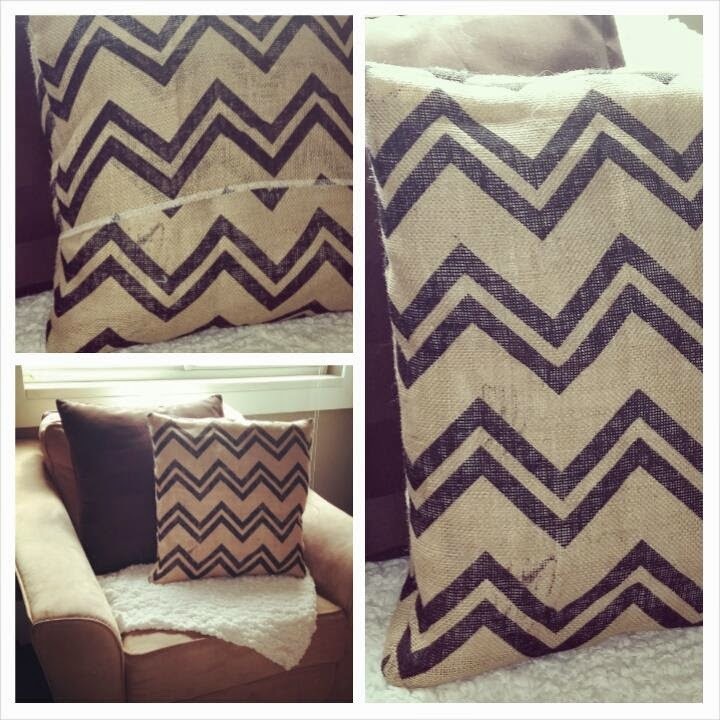 I do have more burlap so.....if you are looking for a specific size please leave a comment below! Shipping for these pillow envelopes is also available!